MTA spokesman Kevin Ortiz tells MSNBC's Chris Jansing that water has infiltrated some of the subway tunnels in New York City and describes what it will take the get the system running again. A deluge floods the Brooklyn-Battery tunnel in Manhattan as Hurricane Sandy made its approach in New York on Monday. Updated at 12:34 a.m. Tuesday ET: Storm water flooded parts of lower Manhattan on Monday night, pouring into the Brooklyn-Battery and Queens Midtown tunnels, bursting into a subway station and even cascading into the construction site at Ground Zero. The floodwater appeared to be receding around just after midnight Tuesday morning. Superstorm Sandy made landfall in New Jersey, but its wide wingspan crossed the Tri-State area, shutting off power to millions in the region and forcing the residents of the nation's biggest city to stay indoors. Most of Manhattan below 39th Street was without power, Con Edison spokesman Bob McGee told NBCNewYork.com. Mayor Michael Bloomberg spoke directly to New Yorkers, emphasizing that those who didn’t leave when the warnings were issued now stay put, stay away from windows and close the drapes. He told limo and taxi drivers to stay off the road and asked that residents not dial 9-1-1 unnecessarily. The mayor said the emergency line was receiving 10,000 calls per half hour; typical is about 1,000 calls per half hour. Floodwater is now receding following significant flooding in the lower Manhattan area of New York City, blocks from the World Trade Center site. WNBC's Ida Siegal reports. About 250,000 people left Manhattan. That’s short of the 375,000 people who live within six and seven feet of sea level and who were ordered to leave the city. At Battery Park at the southern tip of Manhattan, the water level rose to a record-breaking 13.88 feet. The previous record was 11.2 feet, set in 1821. Photos posted to social media told the story: A haunting image of a lit carousel halfway submerged in Brooklyn; what appeared to be a waterfall pouring into a parking garage, running over cars; water gushing into a Hoboken, N.J. subway station, through an elevator door and past the turnstiles. 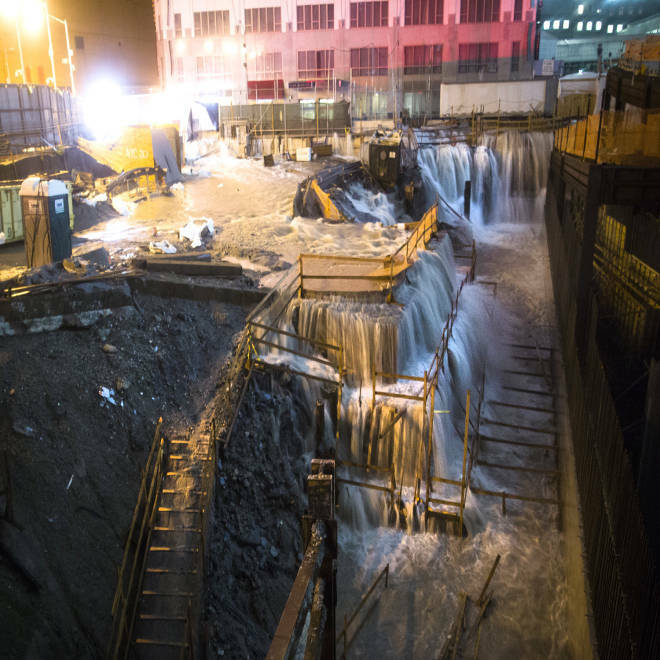 One photo provided by The Associated Press showed water running down into a construction site at Ground Zero. Water floods the Ground Zero construction site on Monday in New York after Sandy came ashore to the south. On Staten Island, rescuers responded in boats at the water line rose, reaching the attics of some homes, NBCNewYork.com reported. Reports from Coney Island and Brighton Beach indicated that ocean water had started making its way through the streets. 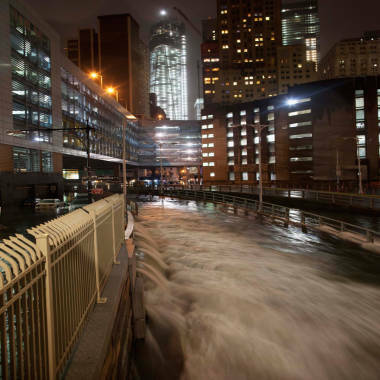 Across the Hudson River in Jersey City, N.J., City Hall and the Jersey City Medical Center were surrounded by water, the Jersey Journal reported. Fire Director Armando Roman said, according to the Journal, that he was on his way to a building when rising waters trapped his vehicle.